There's one more baby filling up news feeds on Facebook. Meet Maxima Chan Zuckerberg. Mark Zuckerberg's wife Dr. Priscilla Chan gave birth to the couple's first child, a daughter, early last week. "Max, we love you and feel a great responsibility to leave the world a better place for you and all children," Zuckerberg and Chan said in letter to their daughter, which they posted on Facebook Tuesday. "We wish you a life filled with the same love, hope and joy you give us. We can't wait to see what you bring to this world." 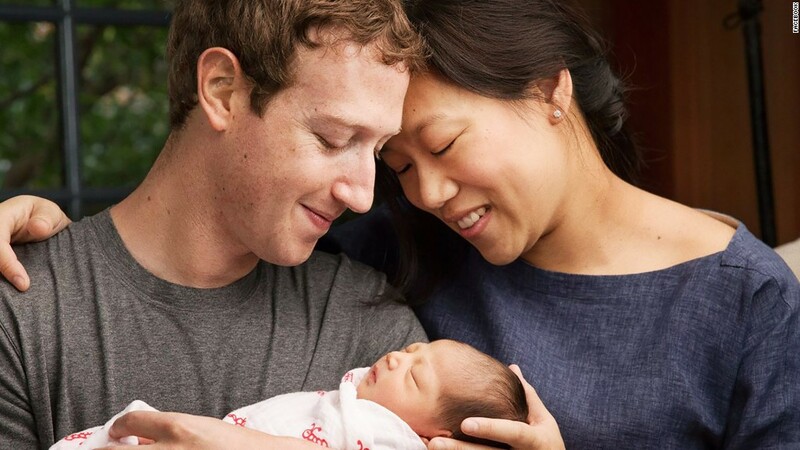 In announcing their daughter's birth, the couple also pledged to donate 99% of their Facebook stock -- worth about $45 billion -- "during our lives" to promote equality and the human potential. Zuckerberg, 31, and Chan, 30, first met at a fraternity party while students at Harvard. They married nine years later in 2012, the day after Facebook's initial public offering. The couple first announced the pregnancy in July with an unusually personal post on Facebook. Zuckerberg revealed he and Chan had three miscarriages, and said he hoped talking about the experience would help others going through the same thing. Zuckerberg drew attention again in November when he announced he would take two months of paternity leave. The choice was surprising for a highly visible CEO, and could set a positive example for other parents working in high-stress jobs. Facebook (FB) has long offered its U.S. employees four months of parental leave. Last week, it announced it was extending paternal leave to four months for all male Facebook employees around the world. Technology companies competing for talent have been bumping up their parental leave policies over the past year, including Netflix (NFLX) and Microsoft (MSFT). Facebook has not yet announced if there will be an interim CEO while Zuckerberg is out. Chan is taking an undisclosed amount of maternity leave from her job as a practicing pediatrician and position as CEO of The Primary School. The former teacher launched the free private school earlier this year with Zuckerberg. The new model of school combines healthcare and education for underserved children. Baby Max won't be able to join Facebook for another 13 years, the minimum age for opening an account. Federal laws prohibit collecting personal data on children under 13-years-old. But if Zuckerberg and Chan are like most other new parents, they'll likely bombard their friends and family with baby photos on the social network.